Students and chaperones from The Kings Christian School spent a week learning about history, physics and math in places like Historic Williamsburg, Yorktown, Jamestown, Appomattox and Busch Gardens. Investors Bank presents checks from the Investors Bank Foundation and Roma Bank Community Foundation for $10,000 to The Kings Christian School in support of its Destination Education program. 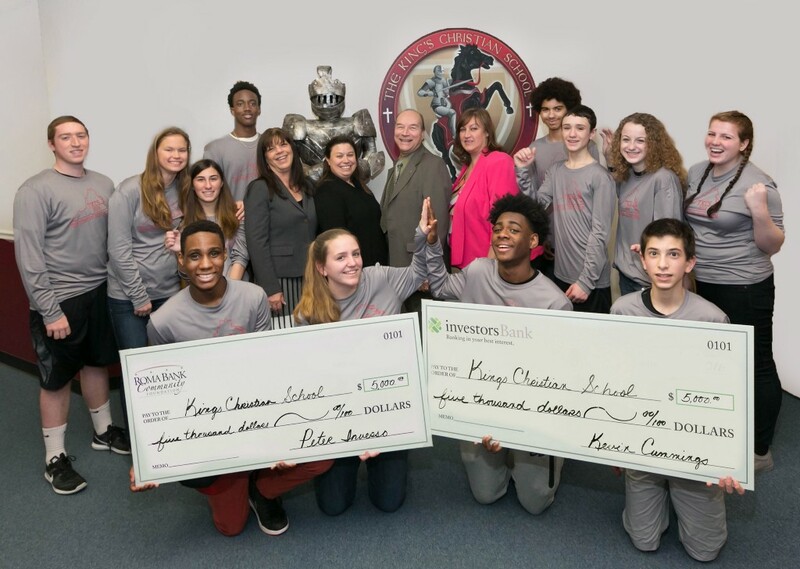 Pictured are students from The Kings Christian School (gray shirts), and second row, adults from left, Marylynn Harkinson, Investors Bank assistant vice president, Cherry Hill branch manager; Danelle Stow, teacher at The Kings Christian School; and Investors Bank Senior Market Manager Carmine Pannullo and Assistant Vice President and Medford Branch Manager Carol Eckert. For more than a dozen students at The Kings Christian School in Cherry Hill, learning means hitting the road and heading for Virginia, thanks in part to grants totaling $10,000 from the Investors Bank Foundation and the Roma Bank Community Foundation. Beginning on June 17, students and chaperones from The Kings Christian School spent a week learning about history, physics and math in places like Historic Williamsburg, Yorktown, Jamestown, Appomattox and Busch Gardens as part of a program named Destination Education. The program gives the students a different perspective on the lessons they are learning in the classroom. The program has been running for a number of years at The Kings Christian School. Students who participated last year, for example, visited Colorado and toured such places as Red Rocks and Pike’s Peak, as well as several colleges and universities. Teacher Danielle Stow said that student leadership within the group planned the trip for months with the adults. “The planning also is a great learning experience,” Stow said. The students also visited local colleges and universities in Virginia such as William and Mary and Liberty University, among others. Donations from Investors Bank and Roma Bank Community Foundations helped pay for the program. The Kings Christian School applied for the grants from the Investors Bank Foundation and Roma Bank Community Foundation, which supports non-profit organizations that enrich the diverse communities served by Investors Bank.